Composite (mid-point method) relationship charts. This is the calculation of the shortest arc between two planets or points from each chart. For example, the shortest arc between chart 1’s Sun and chart 2’s Sun is calculated. This becomes the composite relationship position of the Sun. And so on… This chart can be saved and progressed etc as a natal chart. Various options will be available. Apologies for the delay for those waiting for composite charts. Nearly there! Note: Comparison and Composite charts can be saved to Your Charts. What type of composite chart is available? A secondary progressed composite chart is calculated from the two natal charts that comprise a composite chart. 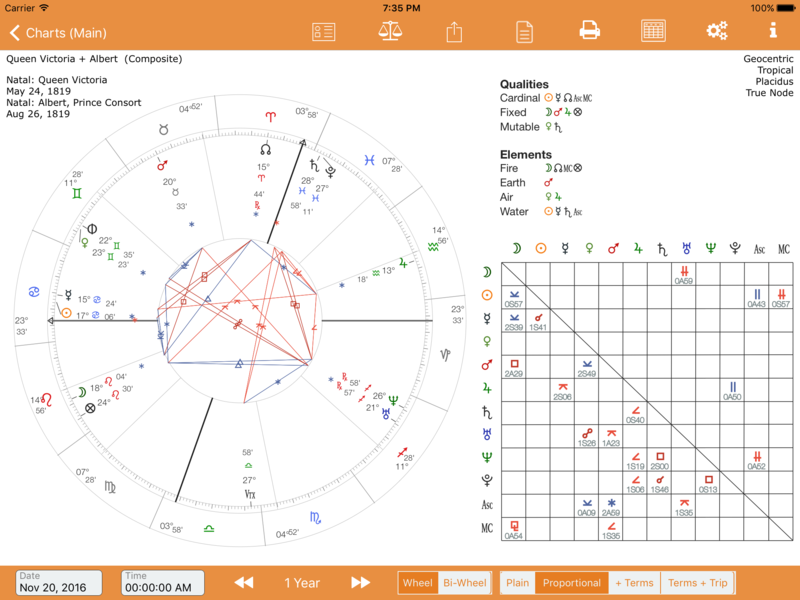 Calculate the midpoints between two natal charts. 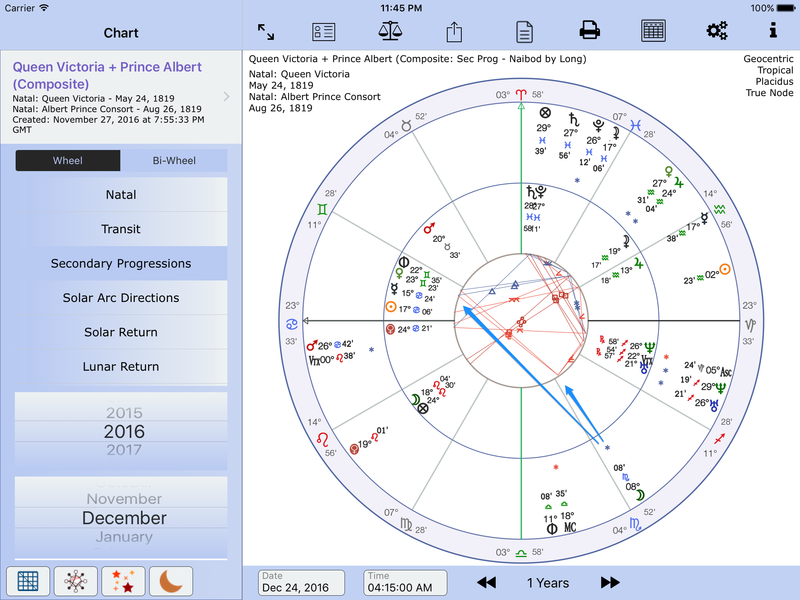 Calculate the midpoints between the two progressed natal charts. Each chart is individually progressed. Composite declinations/latitudes are not taken into account. Is not possible to calculate the Day or Hour Lord for synastry charts. All parts/lots are calculated from the composite Asc, Moon etc. The midpoints for the vertex and East Point are calculated. Fixed star aspects represent a challenge for composite and comparison charts. Which epoch should be used? Consider that if two natal charts of very different years of birth are used to construct a composite chart how do we decide which year (epoch) to use to calculate the fixed star aspects? The composite chart has no year of birth, nor a day of birth or a place of birth. It is entirely astronomically artificial. So what to do? The epoch is taken from the first named natal chart date. If the difference in years between the two natal charts is insignificant, possibly less than 50 years, the aspects will be accurate enough. 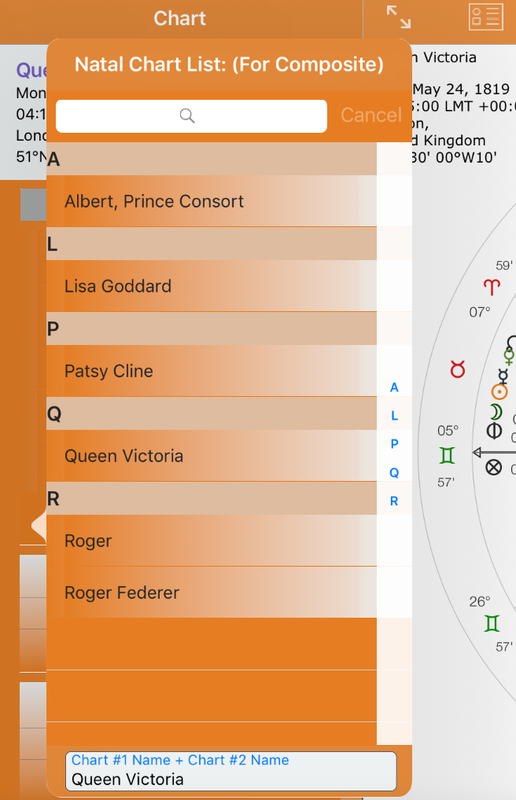 For instance in the composite chart of Queen Victoria and Prince Albert they were both born on 1819. The fixed stars calculation can use the 1819 date as the epoch without any concern as to relevance and accuracy. This also applies to comparison synastry charts. 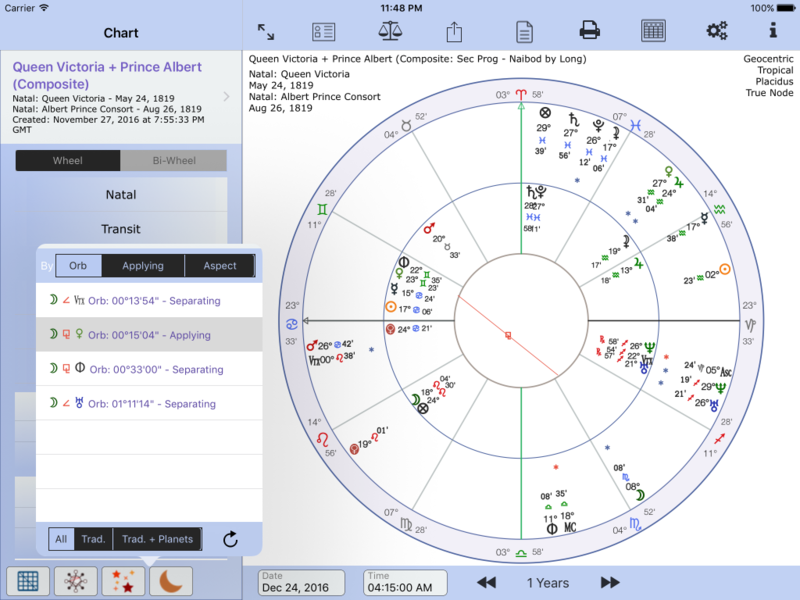 To include Prince Albert and Queen Victoria charts in Your Charts list please download this csv file and copy to your AstroConnexions DropBox app folder. Then use the Import AC Provided charts option. Import them into Your Charts. You may need a PC to do this. I’m not sure if the iPad can do this? 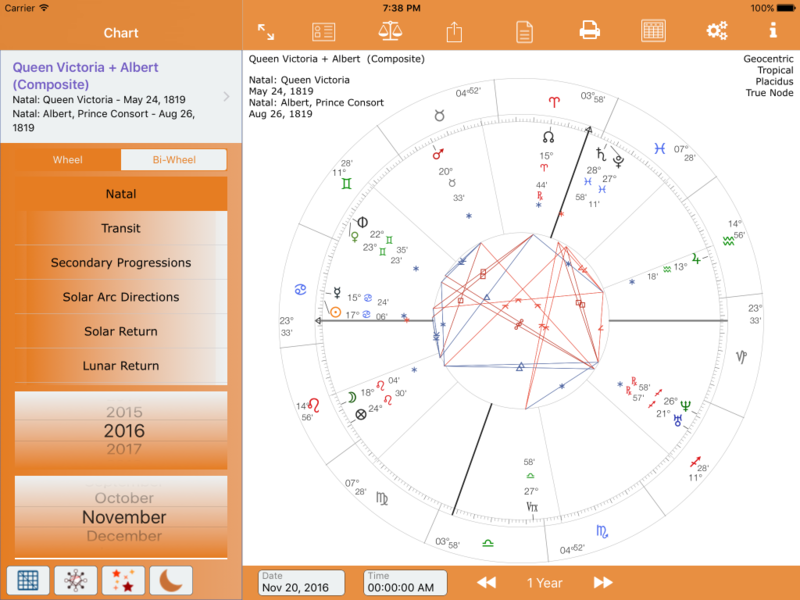 Please note synastry charts are only available when using the Your Charts database. Queen Victoria and Prince Albert progressed Composite with progressed to natal aspect lines – showing the progressed Moon aspecting natal Venus via the Moon’s aspect record. Natal Chart List for Composite – Entering a composite chart name (usually by entering the second chart’s name – the first chart’s name is automatically entered by AC – it’s editable) and choosing the second chart by tapping a chart name record. 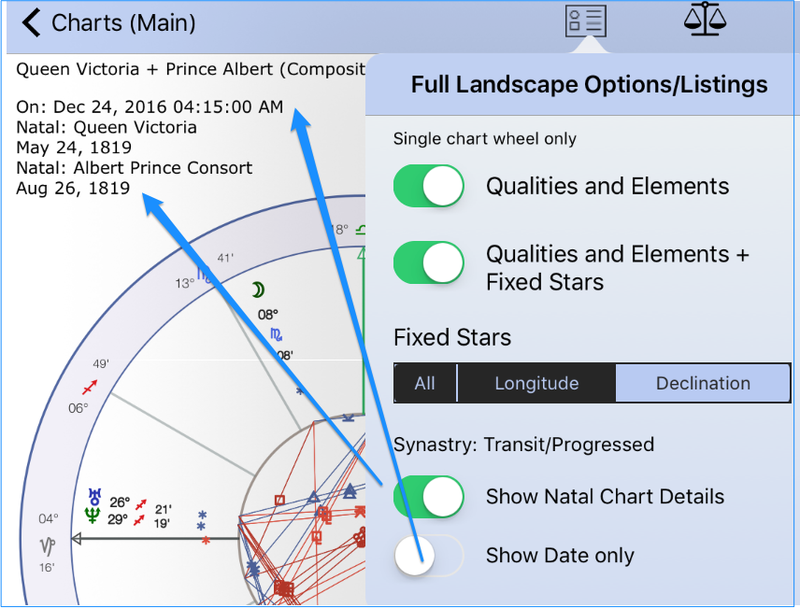 For single-wheel synastry charts there is a choice of using the already defined natal orb, or a fixed orb. For bi-wheel charts: (secondary progressed composite charts) the standard orb for progressed charts is used.